Building highly wide-ranging cloud service APIs and Applications that cost-effective thus turning business agility a reality. All companies these days are looking for solutions that offer quick access to files and data from remote locations, with easy organizing and managing facilities. Every IT department in the world is looking for a platform where developers can write applications that run partially or entirely in a remote data center with the flexibility to choose any development tools. A platform which allows building and organizing of websites, and also supports transfer and assimilation of existing codes and application is the need of the hour. With the advent and advancement in the cloud technology, these necessities were made achievable. Microsoft Azure was built by Microsoft as a solution to all the above challenges. Microsoft Azure is an open and flexible cloud platform services. Microsoft Azure services can be used within applications such as Windows Azure Storage, SQL Azure and the Service Bus. Applications can be built using any language, tool or framework. It also provides a range of functionalities to build applications that extends from consumer web to project setting, including cloud services operating systems and a set of developer services. The key components of the platform are Windows Azure, SQL Azure, and Windows Azure App Fabric. 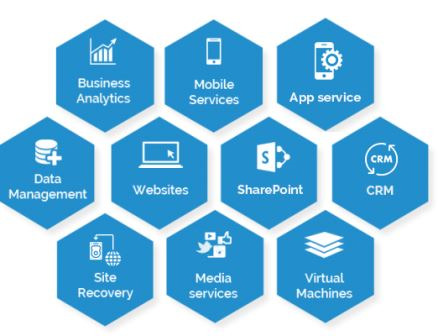 Enaviya provides an easy-to-use Microsoft Azure management service and commanding tools to manage the applications from any platform. It gives way to third-party hosting services, giving the opportunity to assemble mini-Azure cloud services under the brand. Flexible Reaching New Markets: Ability to respond to customer needs for multiple application development tools, automated service management, and global datacenter presence. It focuses on competitive differentiators to reach new markets faster. Choosing on own interest: While the focus is on business challenges and customer needs, Microsoft Azure authorizes IT department to choose where and how to manage, deploy, and store data. A Simplified Approach: The developers do not need to learn a new language. They can create and administer applications and services utilizing common languages such as .NET, Java, PHP and Ruby. Reliable Solutions: Cloud computing from Microsoft is 24/7 reliable support, cloud power never runs out and can integrate public cloud applications with the existing IT environment. Enaviya offers a quick build of organized applications. It helps to select the languages of choice, tools and frameworks with attractive purchase options. It also enables to assemble and run on available cloud applications without focusing on the infrastructure. It provides built-in network load balancing and resiliency to hardware failure. Enaviya services allow you to reduce latency and deliver great application performance anywhere in the world.